From reading Parts 1 through 3 you accepted the responsibilities of becoming a dog owner, decided upon the age and gender of your pet, narrowed your breed alternatives, and learned how to evaluate breeder, shelter, and rescue facilities. The next step is learning how to examine adult dogs and individual puppies from within a litter to determine their suitability for inclusion into your household. This section will deal primarily with evaluating a puppy. Part 4A addresses examining adult dogs. The examination procedures for puppies are somewhat different than those used with adults. Adults have clearly defined temperaments. Consequently, adult tests strive to evaluate present temperament; whereas, puppy tests aim to predict future temperament. The following puppy tests can be modified for use with adult dogs. However, exercise caution when a specific test may elicit an aggressive response. A bite from an adult dog is potentially far more injurious than a nip from a puppy. You will probably obtain a more thorough and accurate analysis and present less risk of injury by following the more conservative adult evaluation protocols described in Part 4A. First of all, puppy tests are not always highly accurate if they are performed just once. Puppies change dramatically from week to week in their development. Moreover, tests results can be altered by the dog’s momentary energy level, which may vary dramatically from sleepy to playful. Thus, puppy tests have the greatest probability of accuracy when they are repeated on two to three separate occasions after the pups are at least seven weeks of age. The following tests are simplified adaptations from work completed by Joachim and Wendy Volhard and William H. Campbell. To discount group dynamics amongst the litter, we recommend that you test each puppy individually in a quiet, non-distracting indoor or outdoor environment out of sight from the dam and littermates. Procedure: Have a helper place the puppy on the ground four feet away from you in a quiet test area. Kneel, then clap your hands lightly while softly calling “puppy, puppy, puppy” in a happy, excited voice. Puppy came quickly and/or interacted readily after arriving = High (H). Puppy came, but not quickly and did not actively interact after coming = Medium (M). Puppy came slowly, apprehensively, fearfully, or not at all = Low (L). Procedure: Start next to the puppy, then walk away while tapping your leg, humming, or repeating “puppy, puppy, puppy” in a soft, happy voice. Followed confidently and closely while interacting with playful behavior = (H). Followed confidently, but not as closely and with no playful interaction = (M). Followed apprehensively, fearfully, not at all, or walked away = (L). Procedure: Kneel while holding the puppy, then calmly roll the puppy on its back, softly keeping a single hand on the pup’s chest to restrain movement for 30 seconds while maintaining a friendly, quiet, placid demeanor. Puppy forcefully and continuously flailed, nipped, clawed and resisted restraint = (H). Puppy initially resisted then relaxed or intermittently resisted then relaxed = (M). Puppy immediately relaxed and accepted restraint, appeared fearful, or froze = (L). Procedure: Immediately upon completing Test 3, remain kneeling while placing the puppy in front of you, the puppy’s head facing you, and his body at a slight angle. Smoothly pet or stroke the pup from the top of his head, down his back, through the start of his tail, until he provides a definitive response. Jumped rebelliously, pawed, scratched, nipped or growled = (H). Relaxed, cuddled, licked or lightly squirmed = (M). Submissively rolled over, appeared fearful, froze, or shied away from contact = (L). Procedure: Immediately upon completing Test 4, stand straight, then bend from the waist, and lift the puppy 6 inches off the ground while supporting his chest with your left hand and his abdomen with your right hand. Maintain the elevated position for 30 seconds. Puppy forcefully and continuously flailed, nipped, or growled and resisted restraint = (H). Puppy barely resisted then relaxed or relaxed from the inception = (M). Procedure: Immediately upon completing Test 5, kneel beside the puppy, then lift one of his front paws (6a). Next, grasp the webbing of the paw, and lightly apply pressure between a finger and thumb. Slowly increase the pressure until the dog provides a definitive response (6b). Puppy growled, snarled, nipped or immediately attempted to resist control = (H). Puppy accepted control of his paw in a relaxed manner = (M). Immediately appeared fearful, froze, or pulled away prior to increased pressure = (L). Pup accepted high pressure before whining, squealing, mouthing, or pulling away = (H). Puppy accepted moderate pressure before squealing, mouthing, or pulling away = (M). Pup accepted low pressure before whining, squealing, mouthing, or pulling away = (L). Procedure: From several feet away make a sudden loud, unexplained noise by banging two metal pots together. Pup tolerated sound nonchalantly or confidently investigated source of sound = (H). Pup showed initial concern or apprehension then rebounded or investigated sound = (M). Pup remained inordinately nervous, cringed, shivered, or ran away = (L). Note: If pup totally ignored sound, investigate for deafness. Procedure: From several feet away take a towel, stuffed animal, or tug rope tied to a string and drag it across the floor using several quick movements. Pup is visibly excited by moving object, barks playfully, chases or bites object = (H). Pup ignores object or shows interest with little or no interaction = (M). Note: If pup totally ignores moving object, investigate for vision impairment. Procedure: Roll a piece of paper into a ball. While kneeling next to the pup, tease him with the paper ball to attract his attention upon the object. Then throw or roll the paper ball 5 feet from the puppy. Pup excitedly retrieves object and returns to evaluator = (H). Pup retrieves object without returning or chases object fully without retrieving = (M). Pup remained inordinately nervous, ignored object or chased only part way = (L). Procedure: Take moistened piece of dog food. While kneeling next to the pup, tease him with the food to attract his attention. Then throw or roll the food 5 feet from the puppy. Puppy excitedly chases and eats food, then immediately sniffs for more or returns to evaluator = (H). Puppy lethargically or with moderate enthusiasm chases and/or eats food = (M). Puppy ignores the thrown food = (L). Note: If pup totally ignores the food, repeat the test at a later time when the pup may be hungrier. Procedure: Evaluate the puppy amongst its littermates. Observe for five minutes. Then return a half hour later for a second observation. You may also wish to repeat on a subsequent date. Evaluate the puppy’s energy level in comparison to his littermates. Puppy is in the most energetic third of his litter = (H). Puppy is in the middle group in energy amongst his litter = (M). Puppy is one of the lowest energy dogs within his litter = (L). Procedure: Evaluate the puppy amongst its littermates. Observe for five minutes. Then return a half hour later for a second observation. You may also wish to repeat on a subsequent date. Evaluate the puppy’s dominance rank in comparison to his littermates. The ranking will be subjective based on the pup’s play behavior and interaction with litter members. Puppy “won” most play fights or remained confidently aloof = (H). Puppy’s dominance level appeared in the middle amongst its littermates = (M). Puppy “lost” most play fights or nervously separated itself from other pups = (L). Puppies/dogs that score High on Tests 1 and 2 will generally bond most readily, exhibit the most cooperativeness and desire to please, and become the easiest to train. A Medium score on Tests 1 or 2 will most likely indicate a calmer pet with fewer social needs, albeit one who is more difficult to train than the High scoring pup. We would urge you to stay away from a Low scoring puppy. The Low scoring puppy is inordinately nervous or extremely aloof and will make a potentially more problematic pet. 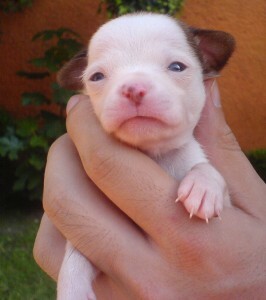 A puppy that does not resist being held and that is not frightened when held is best for most prospective pet owners. A puppy or dog that scored High on Tests 3 through 6a should be reserved for an experienced pet owner or a person prepared to become a firm handler and trainer. A person purchasing a High scoring puppy should immediately engage the services of a professional trainer once arriving home with the animal. Leadership training, impulse control training, household manners training, and imprint obedience should commence as early as 7 weeks of age and continue until the dog willingly accepts human leadership. Waiting until 6 months of age, as is recommended by many books, could create disaster. High scoring puppies who remain untrained have an elevated probability of manifesting dominance aggression and possessive aggressive behavior and to consequently threaten or bite their owners, including children residing within the family. In addition, they are more likely to resent grooming and to exhibit impulse control issues. Medium scoring pups are most suitable for the majority of prospective pet owners. A Medium scoring puppy should exhibit confidence without undue rebelliousness. Medium scoring puppies should adapt well with any family who properly handles and trains the puppy, including families with young children. Low scoring puppies are suitable only for the most placid owners. A hard, overbearing owner will frighten a Low scoring puppy. Families with children should most definitely avoid Low scoring puppies as rough handling or the introduction of many loud, fast moving friends may unnerve a Low scoring animal. Nevertheless, even placid owners should stay away from extremely nervous Low scoring pups. Such puppies may become potential fear biters unless they are diligently socialized and desensitized to touch and grooming upon arriving at their new home. Socializing an extremely low scoring animal will most likely also involve the services of a pet training professional skilled at behavior modification. Ironically, puppies who begin life as submissive or nervous can become both fear and dominant aggressive, meaning they can become dangerous to both family and guests, if they are excessively coddled or their fears are inadvertently reinforced. Unfortunately, the owner who purchases or adopts such a puppy/dog often feels sorry for the animal or is anxious himself/herself. Consequently, unless proper training intervenes, the pet may exhibit fear aggression with strangers and dominance aggression with family members. Test 6b examines the puppy’s threshold for physical pain. A pup scoring High on 6b may be difficult to train, especially if he is not highly cooperative. A pup scoring High will likely require a physical reprimand that will be difficult to implement for many owners, both from an emotional and strength standpoint. A Medium pup exhibits rational comportment and will most likely modify behavior accordingly during training without need for any exorbitant corrections. A Low scoring pup may well become a “drama queen/king” who is difficult to train other than with methods skewed almost totally toward the positive end. Such methods may be successful with a very cooperative pup or one driven by play or food. However, such methods will become frustrating and unproductive with a less cooperative puppy. Moreover, such a puppy has a greater likelihood of exhibiting general nervous behavior, rebelliousness during grooming, and inappropriate fear biting. A puppy scoring High on Test 7 exhibits excellent confidence amidst new environments that include sudden, unexplained noises. For most persons, a puppy/dog scoring High or Medium is suitable. Nevertheless, a High scoring puppy will generally be more suitable for persons wishing a competition or working dog, who live in a noisy urban area, or who live in a loud household with several young children. Low scoring puppies are more likely to exhibit excitable and/or fearful behavior at doorbells, cars backfiring, or other regular noises of everyday life. They also are more likely to develop thunderstorm phobia. We recommend staying away from Low scoring pups. A puppy scoring High on Test 8 will demonstrate greater playfulness and trainability. A Medium scoring pup will become a calmer household pet. A Low scoring pup will likely exhibit inappropriate fearful behavior and is not recommended. A puppy scoring High on Test 9 demonstrates a high degree of friendliness, cooperation, playfulness, and trainability- especially for activities requiring retrieving. A Medium scoring pup is calmer and more aloof than a High scoring pup and is generally less trainable. A Low scoring puppy is inordinately nervous and a high risk for inappropriate aggression. Test 10 examines the puppy’s food drive. A High scoring puppy is the easiest to train, as the pup will work hard to receive a food reward the puppy perceives as highly valuable. Food driven puppies/dogs are generally highly motivated during training and the most enjoyable pets (especially if they are also play driven and social) to train. A Medium scoring puppy will not be as inspired during training but should still be cooperative and motivated. He/she will require shorter sessions and is less appropriate for working or competition purposes. A low scoring puppy will be difficult to train using methodologies that emphasize food reinforcement. Test 11 attempts to match the puppy’s general energy level with the energy level preferred within your household. A High scoring puppy will be easier to train and more playful, but is more likely to destroy the house if under stimulated. A Medium scoring pup best fits the average household. A Low scoring puppy will often be the most difficult to train, but will best suit a sedentary household. 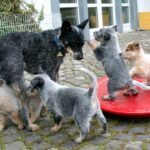 Evaluating play behavior can be beneficial in determining how the puppy will interact with other dogs and may indicate how the puppy will interact with humans. Test 12 evaluates dominance similarly to Tests 3 through 6a, except the earlier tests are more relevant as they examine the pup’s relationship with humans, in contrast to Test 12, which examines the pup’s relationship with littermates. An owner purchasing a High scoring puppy should immediately continue socializing the pup with other puppies or dogs. A High scoring puppy is more prone to bullying behavior, dog-dog dominance aggression, and perhaps territorial aggression unless he/she is amply socialized. A High scoring puppy is also best suited for an experienced pet owner or an owner who is naturally more overbearing or dominant. Medium scoring puppies are most suitable for the majority of prospective pet owners. A Medium scoring pup should mix well with other animals and have the lowest likelihood of dog-dog aggression. Regardless, socialization is still beneficial. Almost all puppies will benefit from a well-designed puppy kindergarten program. 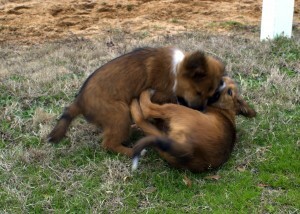 Low scoring puppies need proper socialization to build confidence amidst other animals. However, owners need to ensure that the experiences are productive and accompanied by animals that will play without excessive bullying. Compare all the test results collectively to ascertain whether any puppies from a tested litter are a suitable match for your household or, if the litter has several agreeable pups, which pup is the best match for your family. If you feel uncomfortable conducting the examinations yourself, obtain the services of a CPT trainer, who will confidently and competently assist you through the process. Adding a new long-term canine member to your household is as serious a decision as contemplating engagement or adopting a child. Thus, making the wrong choice can bring years of unhappiness and/or a potentially painful divorce. On the other hand, making the right choice can provide years of blissful companionship, plentiful joy, and an enhanced quality of the life for every human and animal within your family. By completing the protocols provided in each part of this article, you will maximize the probability of benefiting from a successful decision.